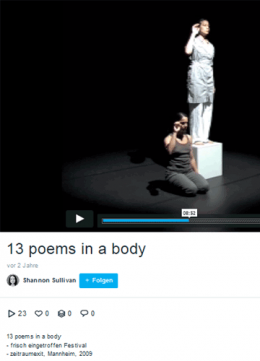 “13 poems in a body” is Shannon Sullivan’s first piece in a borrowed body. 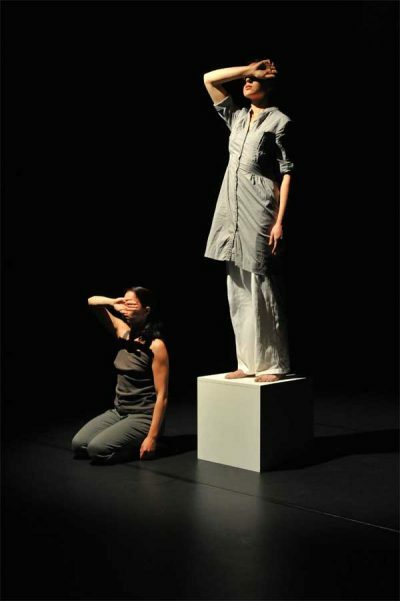 Shannon Sullivan’s production “13 poems in a body” was downright stunning. After a serious foot injury the dancer discovered a new means of expression for herself: language. 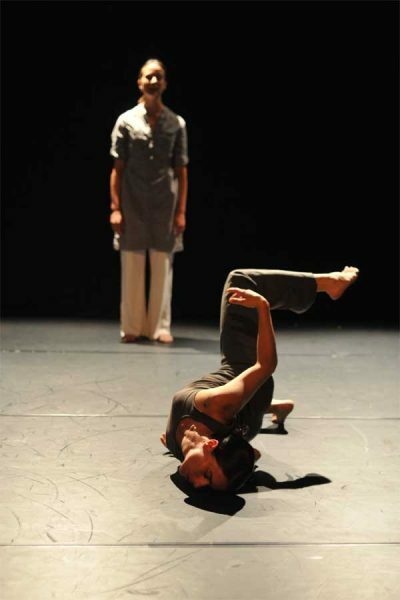 In cooperation with Raffaella Galdi her dance performance provoked movement with spoken word and the other way around. The piece painfully translated mental and spiritual conflict into physical conflict and allowed the audience to intensely feel the torment. A magnificent conclusion to two diverse evenings of theater that offered a promising glimpse of tomorrow’s repertoire of performances. My understanding of language is physical; it comes from the experience of being in a physical body, in a female body. It comes from the experience of dancing, as I’ve done my whole life, in whatever way I could. This inheritance shows in the rhythm and movement of my speech. For me language is not cerebral; language is rhythm, images, music that come from the body. My texts explore how personal physical experiences contain and depict universal questions and phenomena: questions of one’s position and function in society, questions of perception, questions on the existence of collective memory or collective pain. Are there traces of what people in other countries and other times have lived through in my body now? Can I transfer these experiences to another body? The physical body is the central element of “13 poems in a body”: the experiences it has saved in its cells – possibly even from earlier generations – the events that have marked it, what it has to say. We explore the concept of a “borrowed body” or two performers collaborating to embody one being – one using language, the other movement to communicate. The poem “Bullhorns and Billboards”, one of the poems used in the piece, spoken by Shannon Sullivan. The poem “Top”, one of the poems used in the piece, spoken by Shannon Sullivan.